"AL 3" redirects here. For Alabama State Route 3, see U.S. Route 31 in Alabama. Alabama's 3rd congressional district is a United States congressional district in Alabama that elects a representative to the United States House of Representatives. It is based in east central Alabama and encompasses portions of Montgomery and the entirety of Calhoun, Chambers, Cherokee, Clay, Cleburne, Lee, Macon, Randolph, Russell, St. Clair, Talladega, and Tallapoosa counties. 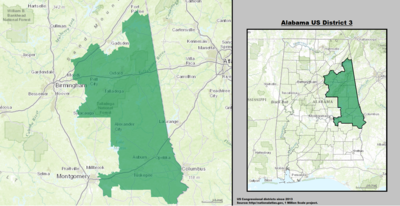 Alabama's 3rd congressional district - since January 3, 2013. The district takes in some of the city of Montgomery. Other cities in the district include Talladega, Tuskegee and Auburn. At the federal level, the district is fairly Republican-leaning, albeit not as strongly as many of the other districts in the state. John McCain carried the district in 2008 with 56.21% of the vote while Barack Obama clinched 43.04% of the vote. The district is currently represented by Republican Mike Rogers and was once represented by Bob Riley, the former Governor of Alabama. March 3, 1825 18th Elected in 1823. March 3, 1835 23rd Redistricted from the 2nd district and re-elected in 1833. 26th Elected to finish Lawler's term. April 22, 1844 28th Redistricted from the at-large district and re-elected in 1843. Resigned when elected to the elected U.S. Senator. 29th Elected to finish Lewis's term. March 3, 1847 Elected to finish Yancey's term. 35th Redistricted from the 7th district and re-elected in 1855. January 21, 1861 36th Elected in 1859. March 3, 1869 40th Elected for partial term in 1868. March 3, 1871 41st Elected in 1868. March 3, 1879 45th Redistricted from the 2nd district and re-elected in 1876. Resigned when elected Governor of Alabama. 54th Elected to finish Oates's term. Resigned to become U.S. Judge for the Middle and Northern District of Alabama. March 3, 1915 Elected to finish Clayton's term. 87th Elected to finish Steagall's term. 92nd Redistricted from the at-large district and re-elected in 1964. January 3, 1973 Elected to finish her husband's term. 100th Redistricted from the 4th district and re-elected in 1972. 104th Elected to finish Nichols's term. Retired when elected Governor of Alabama. As of February 2017[update], there are two former members of the U.S. House of Representatives from Alabama's 3rd congressional district that are currently living. The most recent representative to die was Elizabeth B. Andrews (served 1972-1973) on December 2, 2002. The most recently serving representative to die was William Flynt Nichols (served 1973-1988), who died in office on December 13, 1988.